Spring is the perfect time for a fresh start. Have you been telling your self that you are going to start taking better care of your skin but keep putting it off? Try this simple, gentle at home facial to get you going (and glowing) in the right direction! Step 1: Cleanse – Using your daily cleanser apply to damp skin and massage in upward circular motions for about 30 seconds and rinse. 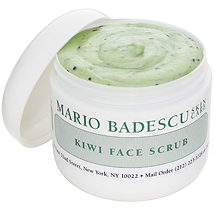 Step 2: Exfoliate – Apply Mario Badescu’s Kiwi Face Scrub, to damp skin and massage skin the same way as in step one for 30 seconds and rinse with warm water. Step 3: Mask – For this spring time facial choose a mask that will leave the skin feeling clean and refreshed. Apply a thin but opaque layer to the face and neck avoiding the eyes. Leave on for 15-20 minutes before rinsing. For combo/oily/sensitive skin types use the Cucumber Tonic Mask. This clay based mask with help detox the skin by absorbing excess dirt and oil without over drying. 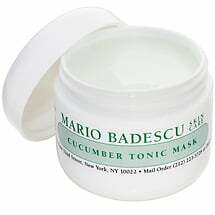 The cucumber extract in this mask has soothing, refreshing and anti inflammatory properties. 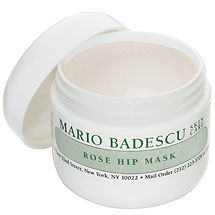 For combo/dry/sensitive skin types use the Rose Hips Mask. This restorative mask is formulated to revive tired dull skin. It contains rose hips extract which is known for its healing properties and antioxidant vitamin C content. Step 4: Tone – Squeeze your daily toner onto a cotton square or round and apply to skin in sweeping upward motions. This will balance the skin and remove any traces of mask that may be remaining on your skin. Step 5: Moisturize – Gently apply your daily eye cream and facial moisturizer and don’t forget your Lip Wax SPF 15.